The screen on my Pioneer DAB car radio is almost impossible to see, even though I have changed the settings. What can I do? When a factory-fitted car stereo is replaced with an aftermarket unit some owners may find that the new display is too dim or too bright. When viewing new car radios in the shop the artificial lighting could be different to the daylight (or darkness) in the car. The radio may also be set to a demo mode, cycling through different colours, text and effects. This can make it difficult to see how it will display a station name or song title. 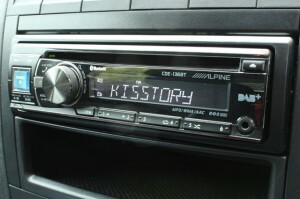 Fortunately many DAB car stereos have display or illumination settings to fine tune the brightness of the display. On the Pioneer radio the settings are accessed through the main menu by pushing in the volume knob, also called the M.C. (multi-control) dial. Turn the dial to ‘ILLUMINATION’ and push in the dial, then turn the dial to ‘BRIGHTNESS’ and push in again. The brightness for the keys and display can be set between 1 and 10. The brightness will change as you turn the dial up and down. Press in the dial to save your chosen brightness level. The available setting ranges differ depending on the dim setting. The dimmer is used to dim the display and buttons at night, when the display does not need to be as bright as during the day. The dimmer can be set manually, synchronised to the clock or set to activate with your car lights. The final option requires that the illumination lead on the rear of the radio is connected to the relevant wire in the car. If the display is still too dim with the brightness set to the highest level the dimmer could be activated. There may be a separate brightness setting for when the dimmer mode is activated. Through the main menu go to settings, ‘ILLUMINATION’ and ‘DIM SETTING’. Choose the ‘MANUAL’ setting and push to select. Press the back button until you exit the menu. You can now try holding the back button until the dimmer is switched on or off, then repeat the above process to adjust the brightness. Finally you could look at the colour of the display. If a red or orange colour is too dim you could try blue or green. More information about changing the colour of the display is found in the user manual. You mention that your previous DAB radio had the same issue. This could indicate that the car is always telling the radio that the lights are on and that the display should be dimmed. Manually switching off the dimmer or setting the dimmed brightness to the maximum level may resolve the issue. If after changing the settings on your radio the display is still too dim or too bright the radio may be faulty. You could contact the manufacturer or retailer for further advice.